Being a “Tech Guy” I am frequently asked, what’s the best way to keep families safe from the internet? Since SLPowers doesn’t focus much on consumer based products, it’s a question that I found difficult to answer. We use several technologies to ensure businesses are safe, but most of those products are not meant for home use, they tend to be cost prohibitive for most consumers. Last year when my daughter asked for her own computer, I had to find a solution that didn’t cost a fortune, but would keep her safe from all the dangers of the cyber-world. After searching Google , I found and tested several products, most of which left me disappointed. I finally discovered two products that fit the bill nicely and were especially budget friendly, since they are free of charge. The first product is OpenDNS Family Shield. We have been using OpenDNS in business for quite a while, so I was familiar with the brand. Basically, they have a DNS system that blocks your computer from accessing all of the bad websites, including adult websites and fraudulent websites. The program also provides a chart of the websites visited from my home network. This free service provides overall, basic, protection for all of the devices on your home network including tablets and smart phones. Although the Family Shield from OpenDNS is great, I wanted to make sure that my daughter is not only safe from the Internet, but also from running a program on her computer that I didn’t approve of her using. Enter Windows Live, a suite of products that are free to the users of Windows 7 and 8. 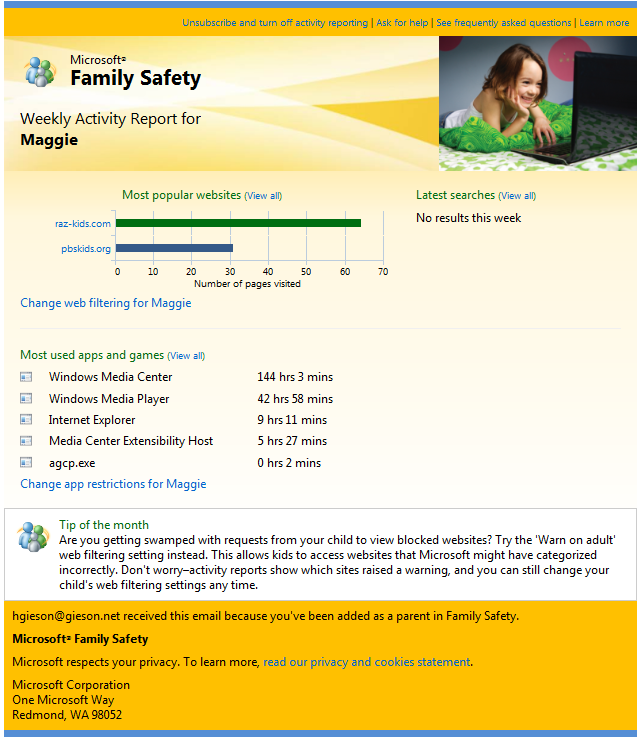 One of the applications, Windows Live Family Safety (WLFS) is software that you setup on all of your Windows-based computers, and works in conjunction with an online portal. Through the portal you create user ID’s which are tied to each user on your network, no matter which Windows computer they are using. This allows you to set up a profile for each user that follows them from computer to computer. The Web filtering can be set to only allow a certain list of websites you have approved, or only allow websites that are specifically designed for children. If my daughter should happen to go to a website that is not approved, a window comes up stating that she needs to get parental permission to access it. She can have me enter a code at the time to grant her access, or click a button to send the request to me via email. WLFS also has provisions for blocking access to any application installed on the computer and restrictions for what type of games can be played. For example, my daughter can only play games with the ESRB (Entertainment Software Board Rating system) ratings EC (Early Childhood) or E (Everyone). By default WLFS uses the ESRB, but other rating systems are available. I also employ the Time Limit function of WLFS. Once 9:00pm arrives, the system automatically logs my daughter off the computer. While this is not a popular feature with her, it ensures that when she goes to bed at 8:30pm, she’s not up playing games past her bedtime. Over time I have come to like the WLFS weekly activity reports best, they reflect which websites were visited, and what applications have been used. WLFS and Family Shield have worked out very well for me, and I think with a minimal investment in time, anyone can protect their loved ones with these products. ‹ Do You Know About Hyper-V Replica?